Your old man is a top man! That is my favourite Utd goal ever . Joining Manchester United age 11 as a right winger, Darren Fletcher was seen as one of United's most promising youth players. Originally featuring in youth teams as a skilful wide-man, Fletcher was going to be United's youngest ever player if a contract dispute didn't prohibit him playing for the first team in May 2000. Refusing to be perturbed, Fletcher would have to wait roughly three seasons for his first team debut in a Champions League match against Basel at Old Trafford. It would be the start of a thirteen year career at the club as a first team player. He would break through and take part in thirty five matches in the 2003/2004 season, with the highlight coming when Fletcher played eighty-four minutes in the FA Cup Final triumph over Milwall. Fletcher would have to wait till the following season to score his first goal for the club in which he scored against Middlesbrough in a routine 2-0 win. This would be the gateway for Fletcher to establish himself as a first team player at Old Trafford and he would go onto make almost 350 appearances before he was moved on to West Bromich Albion in 2015. Before he was moved on Fletcher was instrumental in United's success. He was a key player in the 2007/08 season, taking part in twenty four games, despite being an unused substitute in the Champions League Final. The following year he would be suspended for the Final game against Barcelona at Wembley, and it was a tribute to the Scottish midfielder that so many players commented on how his absence would impact United. After establishing himself as a first team player, the world of football was shocked in December 2011 when Fletcher announced he was taking an extended break from football due to health reasons. At this point he had made almost 200 appearances for United and was considered a key member of the first team squad. After ten months he would return for United in Champions League action against Galatasary, but despite his relatively young age, he would never recapture the form that originally made him a United first team player. After four years struggling with injuries, United chose to sell the player to West Brom in 2015. 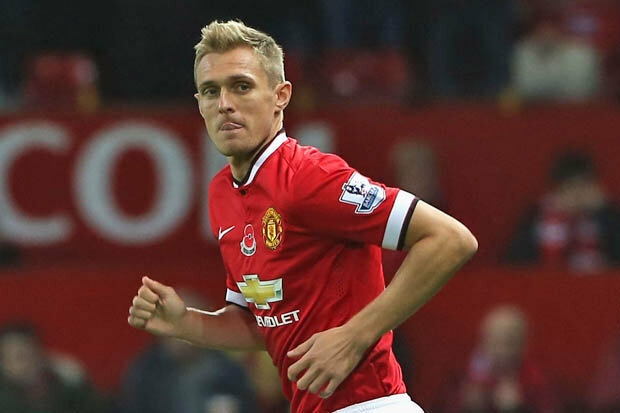 During his time at United, Fletcher picked up five Premier Leagues, an FA Cup trophy and the Champions League. He had evolved from an unfancied Scottish youth player to an important part of United's success throughout the decade starting in 2010. It is a shame Fletcher didn't continue his good run as there is a chance he would have been remembered as an all time great. As it is, United fans are extremely grateful for the memories given by Darren Fletcher. In the summer of 1998, Jaap Stam was signed from PSV. He had just turned 26. The imposing defender would go onto be one of the best defenders to ply their trade at Old Trafford. The fact he spent only three years at the club and yet still got this many votes is testament to the talent of the big Dutch man. Stam made his debut in August 1998 against LKS Lodz. United kept a clean sheet, the first of many with the bald Dutchman leading the defence. Twelve months later, in his first season in English football he had helped Manchester United win a treble. An ever-present figure at the heart of United's backline, he would make fifty appearances across all competitions in United's best ever season. Later on that year he was voted the best defender in Europe and followed that up the following season in 2000. In the three years he played for Manchester United he won three premier league trophies. An absolute rock at the heart of United's defence he would often single handedly keep opposition attackers from the United goal. He was fantastic in the tackle, deceptively quick and refused to be bullied by anyone. 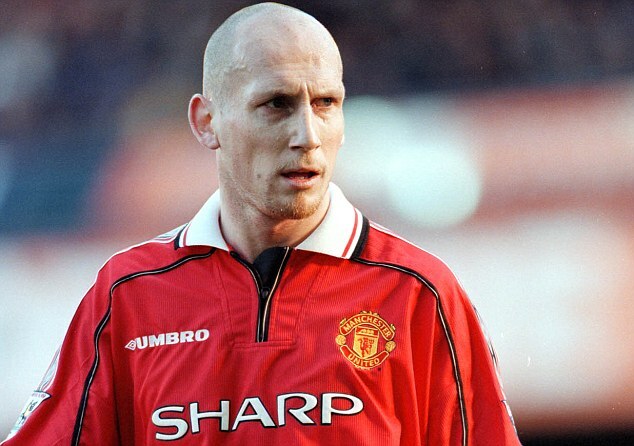 After three years and a troublesome autobiography Stam was shipped out of Old Trafford aged 29. The defender had been somewhat criticised for his performances after an Achilles injury and Ferguson was not happy with some controversial quotes in his autobiography. Nevertheless, the fact that he is this high on the list despite only playing at the club for three seasons and the fact he won a premier league every single season he played at the club means Stam is still sung about on the terraces of Old Trafford to this day. Manchester United's third top scorer of all time has entered the list at number 29. Denis Law is the first of Manchester United's "holy trinity" to appear in this list and his career certainly merits such a high standing in the view of the Old Trafford faithful. Law become the first ever player to win the Ballon D'or while at Manchester United and is one of only four players in the clubs history to have won that honour. This only starts to emphasise how great a player Denis Law was. Law originally signed for Manchester City, but after moving to Italy for a year to play for Torino, the striker returned to the red side of Manchester for a then record signing of £115,000. This would begin an eleven year stint playing for the Red Devils in which the striker would win two First Division titles, an FA Cup and help United to a European Cup in 1968. Law made his professional debut for the club against West Bromwich Albion in 1962. He scored within seven minutes. In his first season at the club he scored 29 goals and helped Manchester United avoid relegation. However, while the club suffered from inconsistent form in the league, Law helped United to an FA Cup (the only FA Cup final of his career) scoring the opening goal in the final. The next year he improved on his form and scored an incredible 46 goals in one season, this is still a club record to this day. In the 1964/65 season Law was instrumental in United winning the first first division title since the Munich air disaster. Law was top scorer in the league that season with an impressive 28 goals scored. His form was so astounding that he was recognised with the Ballon d'Or This was also the year that George Best began to establish himself in the first eleven and along with Bobby Charlton the three would scintillate football fans across the world. Unfortunately Law was injured in the 1968 season and missed the Champions League semi final and final, and his knee would trouble him for the rest of his career, including an injury that kept him out for most of the 1969/70 season. Without these injuries he probably would have gone on to be United's top all time scorer. A brilliant player, Law is still thought of highly at Old Trafford despite playing for fierce rivals Manchester City twice. He has two statues dedicated to him outside Old Trafford, a fitting tribute to the great Scottish player. Mark Hughes signed for Manchester United after leaving school in 1980. He was just 17 years old. Three years later the striker would make his debut in a League Cup second round game against Port Vale as a substitute. Twelve years after his debut he would leave the club for the final time, a certified club legend with over 450 appearances to his name, a massive trophy haul and more individual accolades than he could have ever dreamed of. Hughes established himself as a first team regular in the 1984/85 season. He would go onto score 24 goals in 55 games and maintain a 1 in 2 average in the league. He faced stiff competition from Stapleton and Whiteside, but Ron Atkinson's put his faith in the youngster and it definitely paid off as he continued his scoring form into the next season where he would score another 18 goals. However, at the end of the 85/86 season Hughes moved to Barcelona, where he would spend a couple of torrid years, not quite fitting in at the Spanish club. New Manchester United manager Sir Alex Ferguson decided to bring the player back in 1988 for a then club record fee of 1.6 million. Hughes would go onto win PFA player of the year in the 1988/89 season, the first Manchester United player to ever lift the personal accolade, and personal honours soon changed into team trophies as the striker would help United to an FA Cup a year later. When Manchester United won their first league title for decades in 1993, Mark Hughes was the club's top scorer with an impressive 15 goals in the league. Hughes was instrumental in another Premier League title and in total won three FA Cup trophies in his time at the club. Cometh the hour, cometh the man - Mark Hughes was described as "the best big game player I ever had" by Sir Alex Ferguson and his countless heroics in important seasons for the club means that Mark Hughes is a true United legend. Quite a drop for Denis Law there. Nani over Mcgrath is a farce! Its not though. At his peak he was one of the best players in a team who consistently challenged for the title. Hs was a flair player who was great to watch. What i'm surprised about is that mata has more appearances than nani (according to this thread). Both players are roughly the same, but Mata has indeed made more appearances. Nani didn’t make many in his last three years at the club. I know. He was badly managed towards the end of his time at the club, seemed to drain all confidence from him and has massively affected fans opinion of him i think. This place is obsessed with him. He also benefits from never making the spain squad so gets interviewed quite often on international breaks. Well he got a lot more votes this time in terms of points and I see his name mentioned in a more positive light. As we move on from his career here I think he’ll be remembered very fondly. 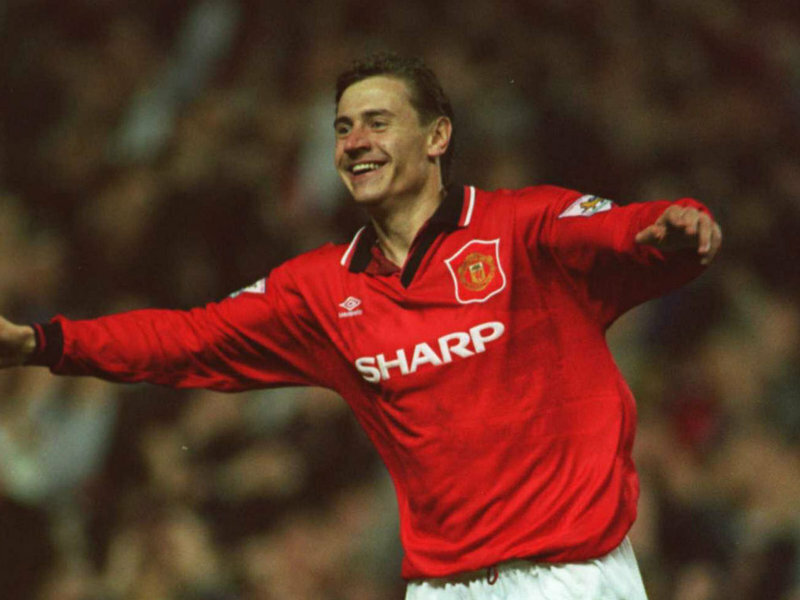 On the 26th March 1991 (there was a time before transfer windows came into play) Manchester United announced the signing of Ukrainian Andrei Kanchelskis from Shakhtar Donetsk for about £650,000. The team were just about to finish sixth and Kanchelskis was signed to add pace and youth to the right side of midfield as players like Robson and Russell Beardsmore were nearing the ends of their United careers. Kanchelskis would have to wait for two months to make his first appearance in the first team, with the Ukrainian winger starting a match against Crystal Palace. United lost 3-0 that day, most of the first team had been rested due to an upcoming game against Barcelona. The next year in the 1991/1992 season Kanchelskis was a first team regular, playing 42 times in all competitions and being part of the team that came so close to ending Manchester United's 25 year long wait for a Premier League. The team were on top most of the year, but got pipped to the title by a Leeds team, nevertheless Kanchelskis added a League Cup Winners Medal to his trophy haul and contributed eight goals in his first full season in a United shirt. Kanchelskis struggled to learn the English language, but his form was so important for United that his interpreter George Scanlon would sit in the dugout during United games to ensure messages could be passed to the winger. The next year, after 26 years of waiting, Manchester United were finally able to win the title. Kanchelskis was an influential member of the team, playing 27 times in the league that season. Sharpe/Giggs and Kanchelskis spent most of the season on the wings and the mixture of youth, pace and athleticism meant that the opposition were simply bamboozled whoever they were facing. With Eric Cantona leading the line, Sir Alex Ferguson had assembled the first of his many great sides. The next year was even better for the winger, as United retained the league but won the FA Cup as well, Kanchelskis also played in the League Cup final, but got sent off in a 3-1 defeat to Aston Villa. By this time Kanchelskis had added a goal threat to his game and the next season was United's top scorer in the league with 15 goals, before he got injured and United threw away the title to a Blackburn side. Kanchelskis soon fell out with Alex Ferguson and never really featured for Manchester United again. He was sold at the start of the 1995 football season, with Alex Ferguson later claiming in his autobiography that he was offered a bribe to sell Kanchelskis and that members of the board at the time had received death threats to ensure the winger was sold. There were mysterious clauses in the contract of the player that meant he would get 30% of any transfer fee received, with a similar amount being owed to his former club Shaktar. Even though the end of his time at the club was surrounded in dubious circumstances the winger was a massive influence in Manchester United's trophies in the early 1990s. “If I want to play for the money, I would accept the Manchester City offer or Chelsea. The red shirt is the really big thing for me." Dimitar Berbatov arrived for £30 million at the start of the 2008/2009 Premier League season from Tottenham. The transfer saga had rumbled on all summer long and it was completed at the eleventh hour, with United starlet Fraizer Campbell going the opposite way in the transfer move. Berbatov was already a well known player in the Premier League and Manchester United fans were ecstatic to see the Bulgarian striker arrive. His incredible technique and his eye for goal made him a favourite at Manchester United. In his first season at the club, Dimitar would contribute fourteen goals to United's cause. Despite having a healthy scoring ratio for Manchester United, his lack of pace and perceived somewhat idle nature worked against him somewhat, with Berbatov missing the Champions League final first 11 in his debut season. However, it was the third year of Berbatov's Old Trafford stay that saw him explode into life at Old Trafford and he would net a memorable hat trick against Liverpool in the Premier League, cementing himself in Old Trafford folklore. In his third year he netted a total of twenty one goals across all competitions. During his stay at United Berbatov won two premier leagues, helping himself to a Club World Championship and a League Cup as well in his four years at the club. When talking about Berbatov you immediately think of his exquisite first touch and his ability to find the back of the net. His scoring ability led him to be the top scorer in the league in the 2010/2011 season, and he still holds a joint premier league records for most goals in a game, scoring five against Blackburn that year. His silky skills and loyalty to Manchester United make him somewhat of a club hero and certainly is a favourite of United fans to this day. My old man mentions that goal once every three weeks or so. Good man... I do too (first Wembley visit). Buchan and McGrath would be higher for me (in terms of talent or how much liked) but it's all opinions. Buchan was a Rolls Royce of a defender and a great captain/servant .... McGrath was phenomenal at times (tendency to occasionally switch off), natural sportsman, comfortable around the pitch. Loved both. Glad to see Kanchelskis high up list. At his best, almost undefendable, caused havoc, a one man outlet, a road runner with a shot and early 90s team still my favourite to watch. For me, unless you have just started watching United in the last say six years, I couldn’t fathom having Herrera above other players. But that is absolutely fair enough ; people have very different opinions. The Lawman should be top 5, not this low. I think people tend to forget the non-marquee/non-flairy players of yesteryears. Nothing to do with how recently one as started following United. I mean, I loved Fletcher, Alan Smith, Park, O'Shea and all. (Hell I've disliked just 3 players who've ever played for us- wishing their careers are absolutely finished-Tevez, AdM and Depay.) But if you ask me to play a highlight reel of Herrera and then of any of the above mentioned players in my mind and decide to choose who my favourite is, the recency bias will take over and I'll always go for the more recent player, if he's been playing well and the older player in case the current player is playing poorly. Are you doing these writeups yourself? Kudos to you if so. Yeah, takes about fifteen minutes for each one and I want to keep myself doing something I enjoy that is relaxing each day. This hits the mark. On the 10th of June 2005, Manchester United signed Fulham goalkeeper Edwin van der Sar for 2 million pounds. The keeper was the latest in a long list of goalkeepers who were signed to replace Peter Schmeichel and was fast approaching his 35th birthday. However, you won't find Tim Howard, Fabian Barthez, Taibi or Foster on this list. Edwin despite his advancing years, will go down as one of the Premier League's best buys. VDS has the distinction of being the first player to arrive under the controversial Glazer regime at Old Trafford and while at first glance he may seem to epitomise the penny pinching nature associated with the club's current owners, Edwin's experience and fantastic goalkeeping presence meant that his time at Old Trafford would bring an incredible trophy haul. Edwin would help himself to four premier league titles and a Champions League while he was at the club. The Dutch goalkeeper was in particular fine form in the 2008/2009 season, when Edwin went for an incredible 1,311 minutes without conceding which set a new Premier League record and it is hard to see that record ever being broken. In his three years at Old Trafford he was named in the PFA team of the year three times and saved a penalty from Nicolas Anelka to capture Manchester United's third champions league trophy in 2008. His remarkable career was down to Edwin being almost the perfect goalkeeper. His height meant he could be relied on to pick out crosses and his fast reflexes and long reach meant only the best of shots could sneak past him. His distribution was fantastic and often set United off on great counter attacking goals. When asked about the impact the Dutch keeper had made, Ferguson managed to encapsulate the strength of Van Der Sar's impact. "He is a winner. He has brought with him a strength of character; he really looks after himself and he trains very well. There are many players who, having achieved what he has done, want to take it easy. But he has a desire to carry on"
Gary made his debut in 1992, in a UEFA cup match against Torpedo Moscow. The opposition didn't score that night as Neville announced his tough tackling style to the world. The Mancunian gave absolutely everything he had to the Manchester United shirt every time he put it on and it was this desire that kept his Manchester United career going well into his thirties. Neville fulfilled a lifelong ambition in 2006/07 when he captained a United side to Premier League success. He was only the fifth United captain to lift the Premier League title with his troops and no-one would have savoured the moment more. Almost twenty years after his debut for United, Neville retired in January 2011 after injuries took their toll on the England international. Neville had made over six hundred appearances for the club. Every single player in this list from this point onwards has a massive trophy cabinet, but when a young Neville made his debut against Moscow, few could predict he would retire with eight Premier League trophies, two Champions League trophies, three FA Cups and a place in the "20 seasons Premier League team". Indeed it is easy to talk about Neville as someone who was passionate but limited in his playing style, but to be in the PFA Team of the year in five different seasons really highlights Neville's fantastic ability. Gary Neville currently sits at fifth on the Manchester United all time appearance list. He has chants still sung about him every week at Old Trafford. His performances on the right side of defence, solid at the back and possessing a great ability to whip a cross in meant that he is one of footballs most decorated players. Not bad for a right back from Bury who dreamed of making it at his favourite club. Of course no write up of Gary Neville is complete without mentioning how much he hated our rivals. This quote from G. Nev sums up how much he lived the United lifestyle. "I can’t stand Liverpool, I can’t stand Liverpool people, I can’t stand anything to do with them." Indeed his celebrations against Liverpool following a last minute winner in January 2006 earned Neville a £5,000 fine. 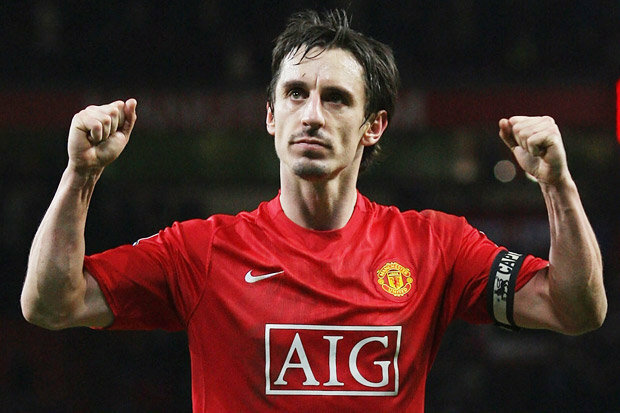 Gary Neville was a fantastic servant to Manchester United and fully deserving of any accolades earned during his career. "I always listen to the little boy inside of me in these situations – when you have to make the harder decisions in life. What does he want? That boy was screaming for Man United." Robin Van Persie moved to Manchester United football club after spending eight years at Arsenal. One year later and he had won the Premier League trophy he had so desperately sought all his time in London. Convinced to sign for Sir Alex Ferguson's last year in charge of the club, RVP wore number 20 as he helped Manchester United to a record breaking twentieth premier league trophy. His first season was absolutely phenomenal, scoring twenty six premier league goals in a campaign where Manchester United blew their competition out of the water. His partnership with fellow forward Wayne Rooney meant Manchester United were firing on all cylinders, and he scored a hat trick in a game against Aston Villa to confirm the title would once again be staying in the red part of Manchester. Throughout the season United would find themselves behind against Premier League opponents, but with the firepower at the club's disposal it was simply a case of blowing the opposition away. After a fantastic first season at the club he managed to lift the coveted Matt Busby Player of the Year award for his amazing contribution. It's a shame we didn't see RVP arrive at Manchester United earlier, as after the initial fantastic season, his stock seemed to plummet rather fast. He seemed to struggle to play for David Moyes and subsequently Louis Van Gaal and while he would add another 22 goals in the next two years, he never really recaptured the magic he showed under Ferguson. Nevertheless his fantastic contribution to our club's most recent success earn him a spot on this list. It's 1 of those weird feelings in football to think RVP only had 1 great season at OT. 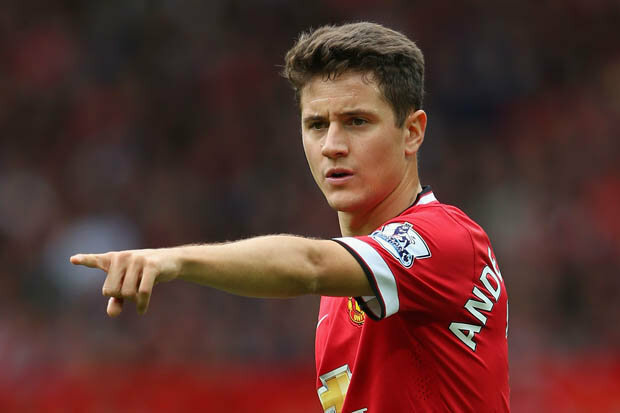 After a long (and somewhat embarrassing) transfer saga Ander Herrera arrived at Manchester United in the summer of 2014. Rumours that the Spaniard would arrive at Old Trafford had been swirling around since David Moyes' troubled tenure, but Louis Van Gaal finally signed the midfielder from Bilbao for around £40 million. Herrera never really established himself as a first team regular under Louis Van Gaal, playing in only thirty-six full league games across the Dutchman's two year stint as United manager. However United fans quickly fell in love with Herrera's style. He was combative and energetic and added a speed to United's style of play. He would have fantastic performances throughout those two seasons, including a brace against Aston Villa and a scintillating performance against Everton at Goodison Park. His most telling contribution during LVG's tenure was an important assist for Martial in the FA Cup Semi Final which sent United onto winning their first major trophy since Alex Ferguson had retired. Herrera would have been disappointed to not take part in the final at Wembley this year, but he still managed to pick up his first piece of silverware at the club. As Mourinho took over in the summer of 2016, Herrera still found himself used mainly as a substitute at the start of the season. However, it wouldn't be long before he started featuring in more games and eventually would be a major factor in United's impressive season. He got an assist for the winner in the League Cup Final and then followed that up with a man of the match performance in the Europa League Final and the coveted Matt Busby Player of the Year award. Since then he has maintained his role in the first team and has grown in popularity at Old Trafford. Relishing playing under new United manager Ole Gunnar Solskjaer, United fans hope Herrera has many more seasons at the club. Herrera over Law, VDS and Neville? For that matter I can't believe Berbatov is above Law as well. People are obviously biased towards recent players. Neville and VDS are recent enough. It's not even 10 years since they retired. I get the recency bias but it's still weird. Maybe it's just me, but none of our current players made my top 10. I can understand someone picking Herrera ahead of Law. I’m too young to have seen Law. Picking Herrera ahead of players like Neville and VDS is more difficult to understand. There must be a lot of United fans who never saw Neville or VDS nowadays. Scary thought. You know what would be interesting, doing a survey and dividing Caf members into age groups, it would give an idea as to the demographics of the Caf. It is mind boggling for me that members of our 06-11 squad are already considered too old. After everything that happened in Andy Cole's early Manchester United career it feels amazing to see him this high on the list. He was a shock arrival at Manchester United in January 1995 with many Manchester United fans wishing the seven million pounds spent on Cole had been used to sign striker Stan Collymore instead. Cole arrived at Old Trafford as Britain's most expensive signing and despite a fantastic 12 goal return from 18 Premier League games, he was remembered for missing two vital chances against West Ham on the last day of the season that would ultimately lead to Blackburn winning the Championship. Next year as Eric Cantona returned, Cole found it a struggle to make an impact at Old Trafford and that summer, Ferguson even offered the player to Blackburn in return for Alan Shearer. 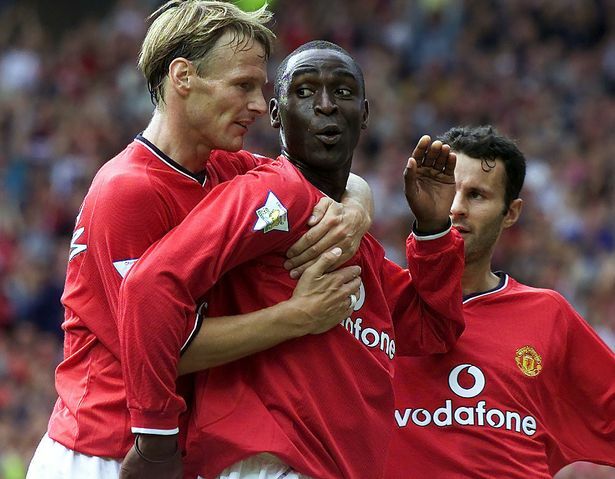 Shearer said no and many thought Andy Cole's days were over. This feeling would only grow stronger when the player would suffer a double leg break in a game against Liverpool reserves, ruling him out for months. However, the English striker would stay for another six years at Manchester United and go on to score over 100 goals overall in his eight years at the club. His scoring form means that he currently sits at 17th in Manchester United's top scorers of all time list. The player would go on to win five Premier League trophies at Old Trafford, also adding two FA Cup trophies and a Champions League winners medal to his growing trophy cabinet. It was the treble season where Cole seemed to be at his most potent, scoring a crucial goal against Tottenham on the last day of the season to secure the Premier League trophy and also scoring the winner in a crucial semi final tie against Juventus in the Champions League. Glenn Hoddle once famously asserted that Andy Cole needed five chances to score a goal and for some reason that idea seemed to permeate the consciousness of football fans in the country, but it never really held up to scrutiny. In his career in the premier league he would have a better goals to game ratio than Alan Shearer (if you excluded penalties). He would rely on pure predatory instinct, a type of poacher that would always show up in the right place at the right time with vital goals. Despite all the criticism that Andy Cole withstood throughout his career he is rightly high up on this list of Manchester United greats and will go down as one of the Premier League's best ever forwards. Shame about his music career though. In July 2005, Manchester United spent £4,000,000 to bring South Korean winger Park Ji-Sung to Old Trafford. Right away fans were sceptical of the move. Previous Asian Premier League stars had been perceived as not up to much, and the general consensus was that Park had been signed for marketing purposes as Manchester United looked to increase their advertising money. That player would go on to have over 200 appearances for Manchester United, would be in Manchester United's top 100 all time most appearances and would win four premier league titles, a champions league and various other trophies. In summary, the player was one of our most valuable players during one of most successful periods. I don't think anyone who put Park on their list would argue he was ever the most talented player at Manchester United. Indeed while Vidic and Ferdinand's tough tackling shone in defence and the dazzling skills of Ronaldo and Rooney would shine further forward, Park became known for his intense work rate and impressive physical fitness. Rio Ferdinand would describe Park as "a real players' player" who was "Up there with best in world for movement, and so intelligent and direct with runs off the ball. His work-rate is unreal, he adds a dimension no other player brings to the team." It wasn't just Rio who would heap the praise on Park, throughout his stay at United his energetic displays meant he was never far away from the first team. He made 34 appearances in his first Premier league season, and would make regular appearances for the next three years as United won three successive Premier League trophies. Although he wasn't named in the squad for the 2008 Champions League final, he was one of only few players to play every minute of the Quarter and Semi Finals. Park also had a fantastic ability to score some massively important goals for the football club. In 2009 he scored a vital goal against Arsenal in the Champions League, helping send United to the final for a second year in a row. In 2009 he would repeat this, helping secure United's first win at the Emirates stadium against their old enemy. Later on that season he would score an incredibly crucial goal against Liverpool in the league that would help send the Premier League back home to Old Trafford. One of my favourite games that. Park was such a fantastic squad player, really encapsulates the spirit of the club for me. He also won over the heart of PSV fans before his move to United. He was so good, nominated in 2005 UEFA Club Football Awards Best Forward. I feel it's a bit insulting when people keep saying that Lingard is as good and will be better than Park. Can't believe Herrera's so high on the list with the amount of legends we've had. Similar type of player to Herrera? Sometimes I think we undervalue PArk. He wasn't just a hard-worker, he had really good technical ability, seldom lost the ball and had a knack of making the right pass and had a good finish on him. One of those players that was so good all around, you could play him in almost any position. Lingard has some ways to go before he's at Park's level, needs more consistency in his play especially the final shot, pass, cross. People think players like Park and Fletcher were just hard-working players, those guys could play. And even htough they didn't play every game, they gave you quality almost every time they were on the field.